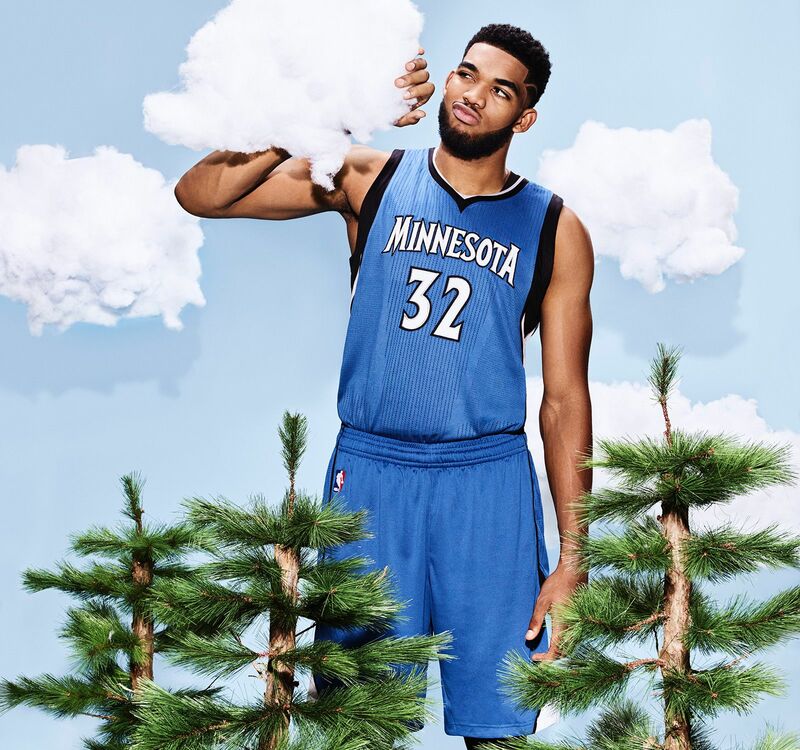 Karl-Anthony Towns isn't just Rookie of the Year or the next great NBA center. He's the man destined to redefine what it means to dominate. Karl-Anthony Towns is struggling. It's a Saturday night in early April at Portland's Moda Center, and the 27-52 Timberwolves are facing the 43-37 Trail Blazers, the season's most improbable success story -- and an aspirational template for the Wolves. Portland, despite having exactly one regular over the age of 26, has cultivated a veteran vibe and culture. It's what Karl-Anthony Towns seeks to build in Minneapolis. But these are things constructed over time with smaller achievements. Tonight in Portland is just another game, one more push of the boulder up the mountain. But by the time it's over, it will become something more: a microcosm of Towns' rookie year and an illustration of why this 20-year-old is not just the next great NBA big but a paradigm for all who will follow. Less than 30 seconds into the game comes the first glimpse. As Blazers forward Mo Harkless slices through the lane and contorts his body for a twisting left-handed layup, Towns knows his front-line collaborator, Gorgui Dieng, has it all under control. Towns is blessed with many defensive skills, among them the ability to seemingly spot a well-timed rejection before palm ever meets leather. So he's already watching the glass, balls of his feet planted, ready to absorb the load of his 7-foot frame before he bounces off the floor and snags what remains of the shot. With only a few games left in the season, Towns' rebounding average has hovered around 10 per game. He set finishing the year in double digits as a personal goal, not so much to bolster his rookie of the year candidacy -- with days left in the season, that's a fait accompli -- but because that's what any self-respecting big man does. Now, with the ball in hand, Towns races his way through traffic down the floor, finds open space and pulls up in transition. Four dribbles and four seconds, that's all it takes. He's a man in a hurry, and the sudden stop of his quick-release jumper appears rushed. The ball barely grazes the rim. Brick. About a minute later in a Minnesota half-court set, he hands off to Ricky Rubio, then sweeps around a few screens to claim his rightful place on the left block. Towns works against Portland's Al-Farouq Aminu, one of these newfangled wings masquerading as a small-ball 4, as if guarding the likes of Towns for 38 minutes a night can be outsourced to any combo forward off the street. Towns flings two hard dribbles as he thrusts his left hip into Aminu, carving out room to work, before stepping back, facing up and unleashing an old-school hook shot, which circles the cylinder ... before popping out. He spends the rest of the half grousing at himself in self-flagellation. Construct a world and it will evolve over time. We can debate the nature of that evolution -- whether it's good, bad or just is. But change is irrepressible, and species that don't respond to the conditions of that change eventually die out. So it is with basketball and the evolution of the big man. From the game's beginning, basketball roles were defined by edict. A team was an aggregation of individual skill sets, a division of labor, and the name for the tallest presence on the floor, "center," said it all: The game would revolve around this guy. The big man was an immovable force, dominating as a defensive presence in the paint. And when one of them got the ball in close proximity to the hoop, you'd better have had a defender of equal stature, or send a second body at him, or both. Jump to the '70s, when in search of competitive advantage, disrupters like Jack Ramsay began finding new functions on the floor for their big guys. Soon you could run offense through the big men in the middle. And then all bets were off. Over time came the mobile big man, then the mobile über-athletic big man, then the mobile über-athletic big man with "skills," then the über-athletic big man with "skills" who also had range. Today, qualifying exactly what a big man does on the floor has become futile. "It's positionless," says Kentucky coach John Calipari, whose program has become a veritable finishing school for NBA big men. Today's game is all pace, all space, all stretch. In each of the past two Finals, the Warriors and Cavaliers have disguised power forwards as centers at the series' most crucial moments -- and often without a traditional big altogether. An open 3-pointer, once the near-exclusive purview of perimeter players, now represents a better value than a hook shot at close range. Last season 7-footers fired up more 3-pointers than in the first 13 seasons of the 3-point line combined. The league has put the big man on notice: It's not enough anymore to take up space in the middle, shoot 60 percent at the rim, rebound in the low double digits and block a couple of shots a night. It's not even enough to shoot a little from the outside. You must now combine power and finesse and make plays for teammates and have quick feet that can switch out on speedy point guards on the pick-and-roll and run the floor and be able to catch the ball on the move and attack like a perimeter slasher and still display that old-school big-man gravitas so that your four Lilliputian teammates heed your commands, hear you calling out defensive assignments from the back line or issue a decree in the huddle during a stoppage. That is the big man of today. But Towns isn't just the big man of today. He is the first big man of tomorrow. By the time the horn blows to end the first half against the Blazers, Kevin Garnett has seen enough. Garnett, who's played 1,462 regular-season games, has spent the season administering a graduate-level seminar to Towns in Big Man-ology, working with him not only on the mechanics but the business of harnessing his intensity. "I remember one night he was playing OKC, and he was pouting and being a bit of a baby," Garnett says. "I yanked him to the side, had some strong, comforting words for him to reassure himself and to get him to gather some confidence. I like to think that we're all human and have human moments. I like to think that was his human moment." Likewise, tonight, during halftime, KG corners Towns in the locker room, and with the team's young future leader flailing under the weight of the moment, the team's elder stages an intervention. "Keep your f---ing composure!" Garnett screams. "Slow down! It's going to be OK! Breathe! Breathe! And slow down! Everything is going to come! Just keep playing hard!" Towns stoically absorbs the weight of KG's sermon. Ask Coach Calipari to describe what exactly it is that makes Towns different and he's likely to tell the story of last August, when Calipari organized a charity softball home run derby in Lexington, where Towns was the headliner. After clubbing a 380-foot moon shot on his way to the title, Towns -- who had not played organized baseball beyond the eighth grade -- received a text from an incredulous Calipari: "Is there anything you can't do? Pingpong, pool, what?" Towns responded: "I do it all, Coach. I do it all." Indeed, despite his size -- Towns was already 6-foot-3 by the time he was 11 years old -- he spent much of his time as a young player in northern New Jersey out on the perimeter. Calipari recalls meeting coaches who had faced off against Towns in high school who described him as someone who would shoot 15 3-pointers in a game. At 15, Towns was invited to compete on the Dominican national team -- Towns' mother, Jacqueline, was born in the Dominican Republic -- to play for Calipari and alongside Al Horford and Francisco Garcia. NBA lifer Del Harris assisted Calipari on the bench, and on the team's second day of practice, he watched Towns jack up a fusillade of 3-pointers. Harris strolled onto the court. "You're 6-10, but you might as well be 5-10," Harris told Towns. "Get yourself down inside and learn the position." Calipari echoed Harris, and throughout Towns' time with the Dominican team and later in Lexington, Calipari and his staff insisted that the 7-footer develop interior skills. "We're not satisfied because he has so much more," Wildcats assistant coach Kenny Payne said after Towns logged 19 and 10 in an exhibition game against a French professional team in 2014. "He has to learn that we play this game from the inside out, not outside in." Twenty-six months later, Towns is sitting in his favorite Italian restaurant in Minneapolis, repeating those words almost verbatim about the Timberwolves. "We have a philosophy that we work from inside out, not outside in," he says as he works his way through a chicken Parmesan (no Parmesan), a brick chicken entree, linguine, potatoes, a platter of roasted Brussels sprouts and a nonalcoholic strawberry daiquiri. "Maybe it's fortunate to blend in with the new, current, modern-day NBA big, maybe it's not. What I can do is be as versatile as possible, where I could have played today or years ago when the 5s were rolling around. That's why I play. I play inside, and I also play outside. I play in both eras." Back in Portland, after intermission, Towns slows down -- and begins to heat up. It's a wide-ranging exhibition, a newsreel of how the revolution will be won. On the second Wolves possession, he pounces into the lane to catch the ball in motion from Dieng -- at which point, forget it. With one dribble, he gobbles up the paint before elevating for a face-up hook that bounces through the net to put the Wolves up four. At the 9:15 mark, Towns drains a silky 18-footer after cleverly popping out into open space when the defense averts its attention. And on the final possession of the third, with the Wolves up 75-72, the Blazers get one final shot. Damian Lillard, who owns final possessions as much as any man in the league, draws Towns on the switch with three seconds to go, crosses over and dances back, but Towns doesn't flinch. He extends his long right arm just as Lillard rises, forcing Lillard to recalibrate his shot, which is futile because there's simply no angle that can clear Towns. As the horn sounds to end the quarter, the shot falls 8 feet short. As NBA coaches survey today's landscape, they frequently come back to the most tantalizing of propositions, best articulated by Calipari: "What if you can play small ball with long players?" What if you can leverage the length of your frontcourt but not forfeit the skills that are traditionally lost by going big? The Thunder showed flashes of this when they nearly upended the Warriors last spring in the Western Conference finals by employing Serge Ibaka, newly stretchy but without the full refinement of a next-generation big. In this regard, Towns is the ne plus ultra. He sits at the midpoint of basketball's great dialectic, a new place where all the properties that made a big man an unmatchable force on the floor for a century are matched with all the innovations that grew out of the Mike D'Antoni Suns teams of the last decade. D'Antoni placed an unprecedented premium on space and tempo, which he believed were the features that best facilitated a dynamic offense. But the space he valued most? The paint. And if the paint was being clogged by a hulking big man with his paw in the air on the block awaiting a post entry pass, then D'Antoni's entire system collapsed. For him, post-oriented power basketball was death, and players who couldn't shoot, move the ball or make quick decisions hampered the entire operation. The league caught on, and what was once a novelty has become the norm in the NBA. In this new league, there's less tolerance than ever for stagnation. Yet as with every dialectic, a new condition has emerged -- and because frontcourt players are smaller than ever, there's a greater advantage than ever to be gained by being big. Towns' capacity to play big and small, inside and outside, to thrive in both one-on-one basketball and in the confines of a fluid system, make him the evolutionary realization of the big man at the moment the league's historical trends are converging. "His skill set is so unique for a 7-footer," says Wolves coach Tom Thibodeau. "He can shoot the 3 with ease from all over the floor -- from the corners, from above the break, from the top of the key. He can put it on the floor. He can change direction. He can Euro-step. He can play back to the basket. He can play a face-up combo game. You can pick-and-roll with him where he's the screener. You can pick-and-roll with him where he's the ball handler. He has guardlike skills. He has great vision. He has playmaking ability. There's a defensive component and there's a drive to be great." It's Thibodeau's job to talk up his big man. But the numbers bear him out. As ESPN's Kevin Pelton noted, Towns' performance last season, when measured by wins above replacement player (WARP), qualified as the 13th-best rookie season since the NBA-ABA merger and the second-best age-19 season behind only LeBron James. According to ESPN Stats & Information, 112 rookies in the shot-clock era have played more than 1,800 minutes, averaged more than 1.2 3-point attempts, averaged fewer than five personal fouls per 100 possessions and posted an assist percentage above 8. One hundred eleven are perimeter players. Towns is the only big man on the list. And he posted the highest player efficiency rating of all of them. It's common for a player in the current era to speak about versatility as a means to an end, as a way to keep defenders off balance as he looks for his shot. But when Towns discusses versatility, he regards it as a virtue unto itself, gospel, a badge of character. "Everything has to be cohesive. 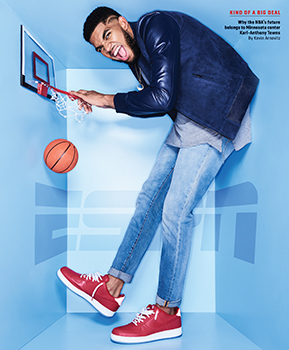 Everything has to jell together -- that's what makes the great ones great," Towns says. "Every day I'm just trying to find ways to keep my versatility high but keep every single aspect of my game working in sync. That's what I try to do on the court. I mean, why limit yourself? I don't limit myself. If my coach needs me to guard 1 through 5, I have worked tremendously hard to have the ability to do that. If I need to shoot, I can shoot. If I need to post up and be a bruiser, I can be a bruiser. I try to be great at all skills." Consider Draymond Green, Ibaka, even Anthony Davis. All have some version of these tools, but they've largely had to develop them over their NBA careers. Towns grew up watching small ball, grew up shooting from the perimeter. And when the Kentucky staff pushed him down low, he was a born ballerina with his footwork. Now, when many big men have vacated the paint and there's ample space near the basket, Towns is moving back into the old neighborhood that big men have been asked to abandon for years. How revolutionary is he? Pick a stat, any stat. Among players who took more than 500 shots last season, only three -- J.J. Redick, Steph Curry and Kyle Korver -- outperformed Towns' shot-making relative to shot difficulty. In an offensive-glass metric that measures a combination of hustle and conversion, Towns ranks fifth in the NBA and on the defensive end ranks in the 86th percentile. As a one-on-one player, he's already elite. Only Chris Bosh and Blake Griffin ranked ahead of him among big men in points per drive, and only Bosh and Green topped him in points per isolation chance. Dig into just about any specific complex shot classification -- layup off a cut, "shake and rise" -- and one thing stands out: Towns is often in the upper echelon in conversion, but his attempts present a far higher degree of difficulty than those of his counterparts. This phenomenon isn't completely unheard of for a rookie on a young team, but it also prompts the question: How good can this guy be? Frustration turns to fuel for Towns in the fourth quarter as the Wolves relinquish the lead after a 7-2 Portland run. He follows his third straight miss -- a galloping hook shot in the lane after bouncing off Ed Davis -- with a strong putback to tie the game at 79 with 9:33 remaining in regulation. And with that, the clinic is on. He calmly sets up for a dribble jumper at the top of the circle with eight minutes left. Then it's a muscular running hook while being bodied up by a couple of defenders who converge as he rolls to the rim. Wolves by four with just over seven minutes to go. Towns has a debonair dance partner in Rubio, and the two perform pick-and-pop waltz to perfection, with Towns draining another shot from the top of the circle off a perfect pocket pass to make it 92-89 just inside of six minutes. And now, with the pop working, Rubio and Towns unfurl the roll. Rubio streaks with the ball down the right side of the lane. Towns rumbles down with him and catches the lob like a tight end. As he does, a gang of Trail Blazers descends on him. Pinned against the baseline by Portland center Mason Plumlee, Towns peers down the floor and sees :09 on the shot clock. He gathers himself, backs out of the parking spot with a few dribbles, then posts again before turning middle on a post-up and elevating for a hook over his left shoulder that falls through. We're inside of five minutes, and Minnesota has stretched the lead to seven. The stain of barbecue sauce on the carpet of Amy Moyer's office serves as one of Towns' many enduring contributions to St. Joseph High School. Guidance counselor Moyer, in whose office Towns frequently took his lunch, used to plead with the teenage Towns to take his lunch to the school cafeteria. She was charmed by his company but felt he'd be better served by socializing for an hour. Towns, though, had trouble folding his near 7-foot body into the cafeteria benches and was wary of the lunchroom scene. "Everybody gawks at me," he told Moyer. "Everybody's looking at me, everybody's wanting to be my friend. I don't get that in here. I can hang out and be myself and relax and not have everybody staring at me." Asked now, Towns denies any self-consciousness in high school, but Moyer describes a kid who wanted affection to be authentic, one who never sought popularity or the mantle of Big Man on Campus. And so it was that during his second year at St. Joseph, Towns would hide out with Moyer. One day he brought a box of chicken nuggets and a tub of sauce and plopped down opposite Moyer at her desk. It was a tight fit for his oversized frame, but the smaller space of the office appealed to his desire for anonymity. Towns typically has a soft touch, but on this day he bricked the nugget dunk, sending a hard rain of barbecue sauce all over the office. For whatever reason, Moyer never had the stain removed. "Every day it reminds me that Karl was here," Moyer says. Karl-Anthony Towns, as always, leaving his mark. Approaching the final stretch in Portland, Towns drains six consecutive shots -- all of them in a nip-and-tuck game against a playoff team on its home floor. And now, trailing by one, the Wolves will have a chance to win with three and a half seconds remaining in the game. Out of a timeout, the rangy Tayshaun Prince -- another of the oldster mentors who has lent Yoda-ish wisdom to the rookie -- takes the inbound on the far sideline and passes to Towns on the right block. Aminu is draped all over Towns, his right arm extending horizontally to poke the ball away and his left reaching vertically to alter any shot attempt, because undoubtedly one is coming in the next three seconds. As the ball reaches Towns' hands on the right block, there's no hesitation. He catches it cleanly: 3.5 seconds left. Then it's a pivot and a long, sweeping drop step toward the baseline: 2.9 seconds left. He elevates, kicking both feet behind him, but he's by no means above or even near the rim. He's looking for space, not height, the angle that can accommodate the soft flick of his wrist. Towns releases a lurching, high-arching baseline hook: 2.5 seconds left. And as it drops through -- 1.8 seconds left -- he turns his back to the basket and clenches his fists. Says Towns, "I knew it was going in before we left the huddle." Kevin ArnovitzArnovitz has been an NBA writer for ESPN.com since 2008. Before that, he was a contributor and editor at NPR.